PolitriX & Tings: When will LeBron LeLearn ? Really LeBron ? It was all about race ? Really ? The media darling that was LeBron "King" James left this world on July 8, 2010. Prior to that date, the kid from Akron, Ohio with superfreakish athletic skills never before seen on a human being of that size was a media darling from the day he stepped into the national consciousness. The kid said and did all the right things, was a great player, lived up to the enormous hype, stayed out of trouble off the court. In this day and age, that is no small feat for a young individual to be awarded with MILLIONS of dollars at such a young age and not morph into a trainwreck of a person either on or off the court. LeBron was different ... that was until "THE DECISION". At the conclusion of an unprecedented NBA Free Agency period, when all everyone could talk about was "will he stay or will he go" in relation to staying with his hometown team, the Cleveland Cavaliers, or would he leave the "mistake by the lake" for the bright lights and big city glamor of a New York, Chicago, or Miami. With the exception of MAYBE the "Food Network" (and I think they may have had a "Whopper or Big Mac ? LeBron's Decision" special on earlier :-), virtually every network on planet earth had up to the minute coverage of "what would LeBron decide ?". The culmination of this summer long drama was to be "The Decision", a 1 hour long special on ESPN, where LeBron would undoubtedly say "I've gotten close to the Promiseland with my guys in Cleveland, and I'm staying home to bring a title to my hometown". And the crowd goes wild !! Right ? WRONG !! As you all know by now, in front of millions of eagerly anticipating fans all across the NBA nation, LeBron broke up with his High School Sweetheart, "The Cleveland Cavaliers", and slowly and painfully stated that "I've decided to take my talents to South Beach" and join the Miami Heat, the smoking hot Latina that came along after he got rich and famous. OH NO HE DIDN'T GIRLFRIEND !! OH YES HE DID !! And it is in this most unfamiliar position LeBron now finds himself, where the beloved has become the hated, where the media darling has become the media target, where he who could do no wrong is now he who can't stay out of wrong's way. Now enter CNN's Soledad Obrien. In response to the CNN reporter's question "Do you think there's a role that race plays in this ?" in reference to the harsh treatment LeBron has gotten since "The Decision", LBJ responded "I think so at times. It's always, you know, a race factor. ".And the blogosphere and mainstream media-sphere went CRAZY !! "LeBron Blames Race for Backlash", "Lambasted LeBron conveniently sees hurtful role of race", "LeBron James doing more damage to reputation by pulling out race card", "Lebron James won't back down from race comment" were but a few of the headlines making front page news in major newspapers and Blogs throughout the nation. In what was a relatively tame and obvious answer to a reporter's question, the mainstream and underground media went absolutely BERSERK saying LeBron is playing the race card, and deflecting blame, and all sorts of over the top reactions. LeBron simply stated the OBVIOUS in RESPONSE to a question about race which we all know is almost always a factor when talking about mostly inner city, mostly black kids, making mega millions of dollars, playing before mostly white fans, for teams owned by mostly white men (with Michael Jordan being the only exception). He simply responded by saying that there is almost always an undercurrent of race but his response was NOT "they only hate me cause I'm black". THAT is the race card; LeBron did NOT state that, yet still he is being lambasted for blaming his fall from the heights of "media darling-hood" on the infamous, never low on credit "race card" . So what is different today and what should LeBron learn from this whole experience ? The difference is simply that we are now living in a "Post 7-8-2010 World" , where everything LeBron says can and will be used against him in the court of public opinion. Whatever he says will be magnified tenfold, sliced, diced, mixed, shaken, and stirred in trying to get those words to align with the new image the media is trying to paint of LeBron as the "rich, overpaid, overhyped, Robin to Dwyane Wade's Batman, coat tail rider, heartless, uncaring, 2nd fiddle, point the finger at others, all about ME, ME, ME" persona. 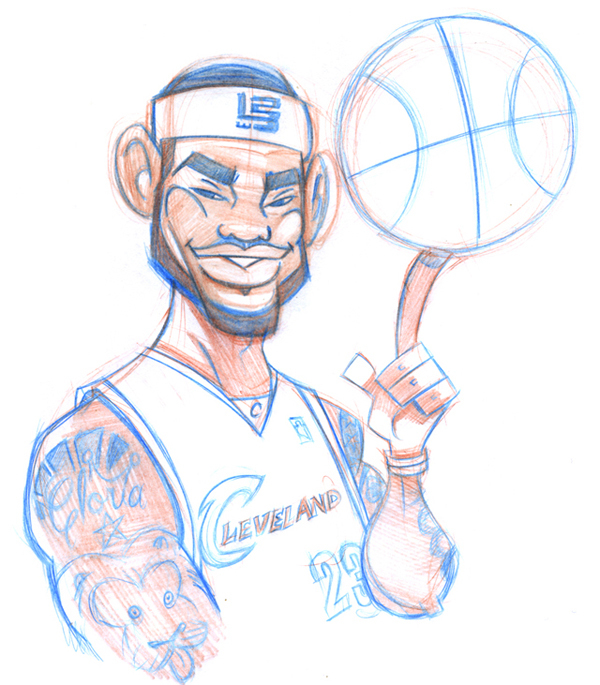 The media has sketched the outline of the image they want the public to have of LeBron. Now they simply have to get his every word and every action to fill in the missing shades and colors of their prefabricated image. This is what you must now learn LeBron. Choose your words WISELY !! Thanks for your words of wisdom dude. As a Miami guy, I'll inform him of your recommendation when I run into him partying in South Beach! !